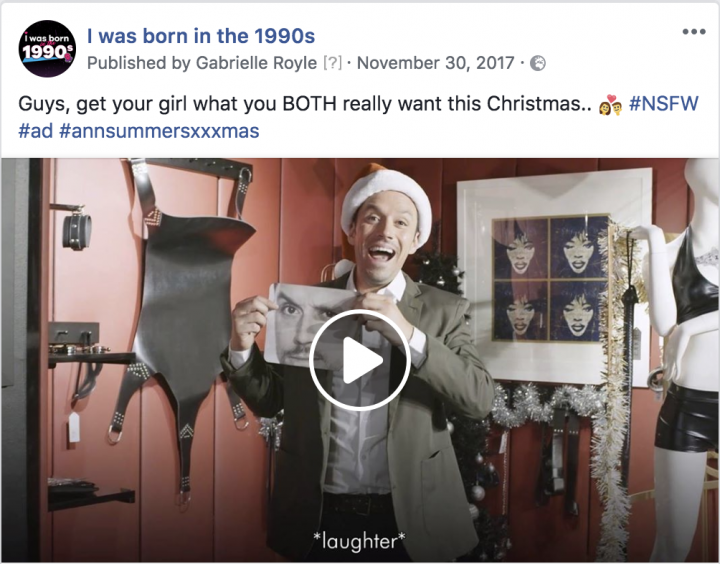 In November 2017 Ann Summers launched a Christmas marketing campaign aimed at targeting males shopping for their partners. We were provided with a video and tasked with distributing it to people likely to purchase in store. By data-matching, we were able to successfully identify a segment of users, who, based on previous purchase behavior were likely to buy. We took a scientific approach to this campaign and profiled users within our network. We were able to identify through previous purchase history a segment of users who were ‘high intent’ for retail shopping. Using a cross-channel approach across both Instagram and Facebook we reached each user in our target segment an average of 4 times increasing their likelihood of purchase in-store. A follow-up, anonymous, survey on users targeted indicated they were comfortable visiting an Ann Summers store and were more confident in making a decision. This was specifically the case amongst a millennial audience, aged 18 – 34. A third of all people segmented for high purchase intent.